On 2 November 1946, Rev. Karol Wojtya said his first holy mass, among others, for his late parents and brother, in St. Leonard’s Crypt in the basement of the cathedral. On 23 September 1958—the day feast of St. Wenceslaus, the cathedral’s patron saint—Fr. Wojtyla was ordained a bishop. For the motto on his coat of arms he chose the Latin words: Totus Tuus (All yours). As the successor of Sts. Peter in Rome, John Paul II visited the cathedral in 1979, 1983, 1987, 1991, 1997, 1999 and 2002.
who faced martyrdom with courage. in our faith until death. After Wawel Castle & Cathedral we walked back to St. Mary's Church to see the beautiful altar piece. 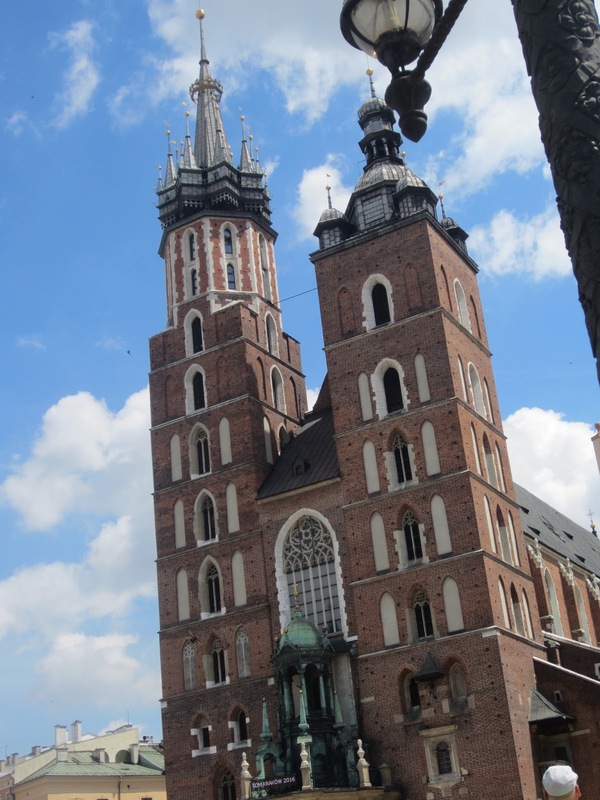 One of the most famous gothic church in Poland, it was built at the beginning of the 13th century. A magnificent monument of medieval wood-carving, St. Mary’s altar was carved by Veit Stoss and is the jewel in the crown of this church. It is one of the largest altars of this type in Europe. It presents a vivid scene of the Virgin Mary falling asleep surrounded by the Apostles, whereas the apse illustrates the assumption and coronation. St. Fuastina, visiting the church, said, “As we were listening to the holy ceremony, the Lord gave me a sign of how many souls would attain salvation thanks to this work of art. Then, I began an internal dialogue with the Lord by thanking Him for the grace of seeing how the veneration for His fathomless mercy is spreading. I immersed myself in a profound thanksgiving prayer. O how great is the generosity of God. Blessed be the Lord who keeps His promises” (Diary 1300). Every full hour a golden trumpet shows above Krakow’s central Grand Square (Rynek Glowny) in the west window just below the spire of the higher tower of the Basilica of the Virgin Mary's. All of a sudden music comes to an abrupt end. Next the same bugle call is played towards the east, the south and the north. At noon the whole ritual has been broadcast on the Polish national radio since the 1920s. The Krakow signal bugle call, or Hejnal Mariacki, dates back to the Middle Ages when it was announcing the opening and the closing of the city gates. The bugler also played it to alarm his fellow citizens whenever he saw a fire or the enemy forces. And the melody abrupt ending is said to commemorate a trumpeter from Krakow who was shot through his throat by a Tatar archer in 1241 when the Mongols besieged the city. After a little break for lunch at a lovely open-air market, we headed off to the Salt Mines. The “Wieliczka” Salt Mine is one of the most valuable monuments of material and spiritual culture in Poland. Each year it is visited by more than one million tourists from all over the world. It is also a world class monument, featuring among twelve objects on the UNESCO’s World Cultural and Natural Heritage List. Today, the “Wieliczka” Salt Mine combines many centuries of tradition and modernity, the history of several hundred years and an underground metropolis with extensive infrastructure. The mine is a product of work of tens of generations of miners, a monument to the history of Poland and to the Polish nation – a brand, present in Polish consciousness for centuries. The sculpture are all made by the miners - out of salt! Incredible the work and faith of these men. Then we went back into old town for Mass at St. Florian's Church - the first church where St. John Paul served as a newly-ordained priest. However, we were running VERY behind schedule - so rather than having our own Mass there at the church, we joined the 6:30pm parish Mass - in Polish. Following Mass, dinner. During dinner the Newbold's met up with some Polish friends who do Civil War reenacting. What a small world it is!